This Sunday’s conference championship games will be some of the most anticipated ever. In both contests, the story consists of a legendary quarterback taking on an up and coming star. 24-year-old Jared Goff will battle the great Drew Brees who just turned 40 this month, and the 23-year-old Chiefs sensation Patrick Mahomes will duel what could be football’s undisputed GOAT: Tom Brady, now at age 41. This 18-year difference is the largest of opposing starting playoff QBs ever. So does Mahomes or Goff have any chance to slay Goliath? 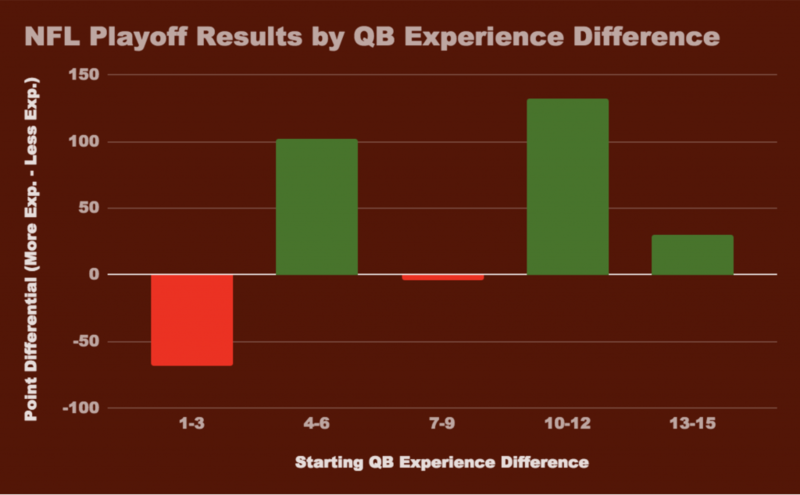 Let’s take a look at how the difference of experience between battling starters has turned out in the postseason during this decade. This chart shows how much better or worse the senior did against the junior, by point differential and differential per game. The first two columns of the chart do not seem too surprising, but when QBs have been 7-9 years apart, the less experienced players have actually outscored the veterans. In 2016, our team right down the road, the Carolina Panthers, annihilated Carson Palmer’s Arizona Cardinals 49-15, thanks to the outstanding play of MVP Cam Newton, which was likely the last hope for 36-year-old Palmer’s chances at a ring. But the biggest surprise of them all was young Joe Flacco’s stunning victory (just before his 25th birthday) over Tom Brady back in 2010 by a solid 19 points, taking advantage of three early Brady turnovers. 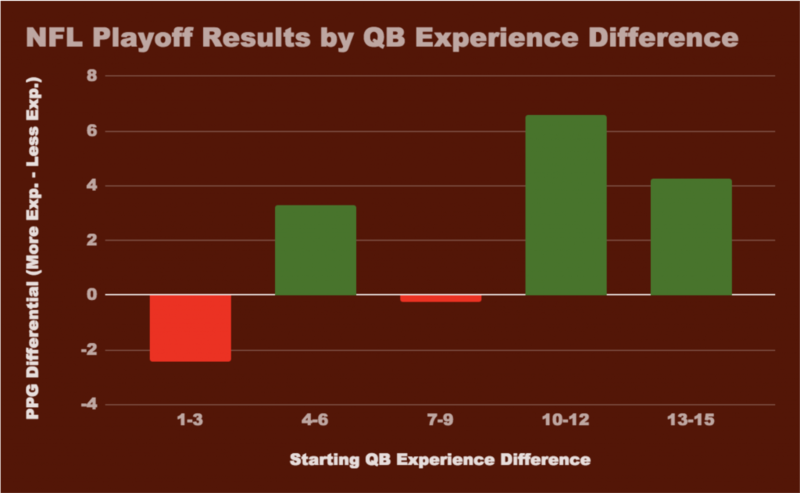 However, when the QB experience reached double digits, the veterans began to take over. The most overwhelming performances include Brady’s bashings of Marcus Mariota in 2018(35-14) and Andrew Luck in the 2014-15 AFC title game by a sound 45-7 (with a possible asterisk due to supposed deflated footballs), along with 40-year-old Brett Favre’s 34-3 win over a young Tony Romo in 2010. So, do Mahomes and Goff have a chance on Sunday? Even with this veteran dominance, one QB has been extraordinary against his older peers. Russell Wilson(in just his second season), albeit aided by his elite Legion of Boom defense, stifled Peyton and the Broncos 43-8 in Super Bowl XLVIII. With the new kids on the block looking legit, despite the data it wouldn’t be surprising to see a complete changing of the NFL guard. But Tom Brady and Drew Brees, the keepers of the castle, will for sure have something to say about that.